Hope you are not tired of Nkoli? "Nooo... mba!" 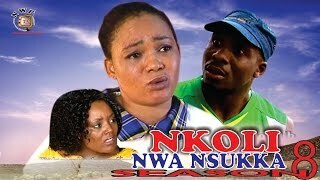 Ok that's good :) Here goes the Season 5 of Nkoli Nwa Nsukka Nigerian Igbo Movie, now also showing on Nigeria Movie Network - starring Rachael Okonkwo, Junior Pope Odonwodo, Mac Collins Chidebe, Lacclass Ozougwu and Uju Ozougwu. The Igbo drama series is brought to you courtesy Nollywood Pictures TV. 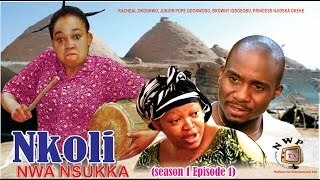 Nkoli Nwa Nsukka Storyline: This is the sequel to NKOLI NWA NSUKKA Season 1, Season 2, Season 3, and Season 4. Following Nkoli’s journey to city and the many challenging events experienced in the city; is a never expected life in the city as the wife of a rich handsome man called Uchenna (Mac Collins Chidebe).Packaged in the movie are very hilarious events and actions associated with this timid girl Nkoli that totally describe the movie as a comedy with the right mixes of action and dialogue.